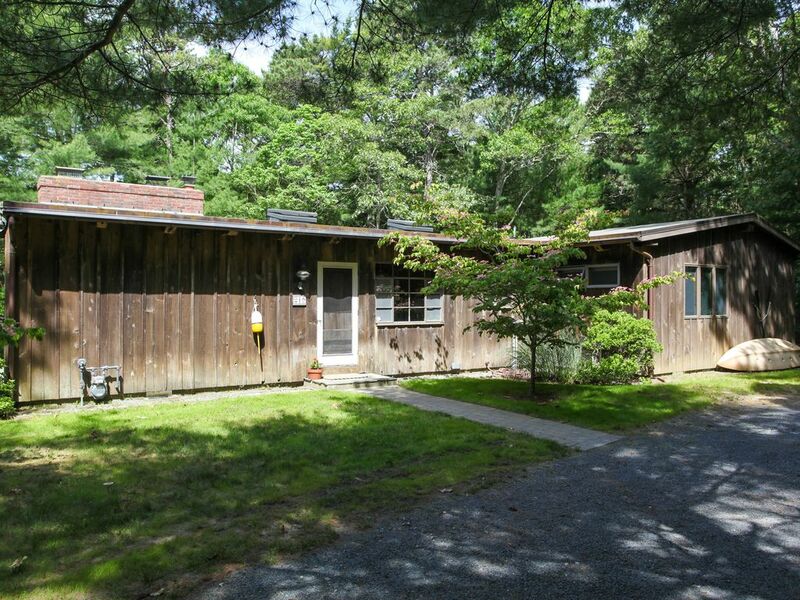 This home is on a tranquil, wooded setting in the Bass River community on Cape Cod. It was designed by John Root Jr., a well-known Chicago architect. Massive timbers were brought from an old barn in New Hampshire so that this structure has great character. The large master suite with its own bath and patio overlooks the woods. There are two additional bedrooms and a guest bath. This rustic home is fully heated and has central air. There is a warm, open living room with glass doors leading out to the patio area. The cabin is set on an acre of white pine forest right in the midst of the Bass River community activities. A very easy walk to beaches, Ship Shops boat yard, moorings, farmers market, Cultural Center and tennis. We really enjoyed our stay - the house is beautiful and feels secluded even if it’s close to everything. The fireplace was a highlight of our stay, and the owners were very responsive and friendly! Would definitely return here. We had a fantastic week in Bass River. The house was great. Everything that was explained was true to form. The owner was great to deal with. Master bedroom was large and comfortable. Beautiful Pleasant Street location. Quick and easy access to Bass River and Smuggler's Beach. This property is clean and has well stocked kitchen, comfortable linens, and helpful washer and dryer. Jeannie is responsive and kind. We enjoyed our vacation! Great spot on Cape Cod!!! This is the second year we have rented "the Cabin" and we absolutely love the place. It has plenty of room for our family and friends and is truly a place to just kick back and relax. The owners are excellent people to deal with and very accommodating. We rented this beautiful home for a guys golf outing. It is set on a wooded lot allowing lots of privacy. The space was ample for all 8 of us. Both gas and charcoal grills were available, and with the supporting well equipped kitchen, we never ate out! Great place! The home was rustic, comfortable and clean. Our stay was short but the owners went out of their way to make sure all was well. Would not hesitate to recommend.